Happy Fourth of July! I’m actually headed up to Virginia today to spend my evening with Matt and Stacy from www.PaleoParents.com and attend their Beyond Bacon Book Release party tomorrow. So, I thought I’d leave you with a fun recipe that you could bring to a barbecue or maybe whip up for a special breakfast treat this weekend. This is actually the first muffin recipe that I’ve made that can really be treated as a basic muffin recipe. You don’t need to add blueberries, but instead can turn these into whatever favorite muffin you have a hankering for. The inspiration for this recipe came from comments on my Perfect Paleo Pancakes from people who had used that recipe as the base for muffins. I’ve been meaning to try this for myself for quite a while. So, when I found myself with a couple cups of blueberries that were getting a bit wrinkly from being in my fridge for a week (I had bought a whole flat at the Farmer’s Market and I guess we’d actually had our fill, which I wouldn’t have thought possible!) and a couple of extra green plantains (I try to always keep green plantains in my home), I felt like it was time to give it a try! I am in love with plantains, both as a versatile starchy vegetable (mashed, roasted, deep fried) and as a baking ingredient (see here, here, here and here). 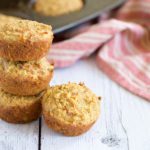 It’s more than the fact that cooking with plantains makes for some pretty great nut-free Paleo baking (which we all know there is quite a demand for with all the nut allergies and sensitivities out there, including mine! ), but that the texture of baking made with plantains is far better (in my humble opinion) than what I can often achieve with nut flours or coconut flour (and even sometimes without eggs like this recipe). For these muffins, I found the secret to a great muffin texture was to increase the fat compared to the pancake recipe. I used coconut oil, but you could just as easily use lard, palm shortening, butter or ghee (I’m not sure if a liquid oil like avocado oil would work). I have used both date sugar and evaporated cane juice to sweeten these muffins (which isn’t necessary if you have very sweet fruit to add or if you’re using something like mini chocolate chips). 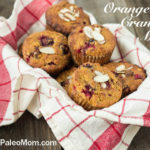 If you plan to bring these muffins to a potluck where non-Paleo people might enjoy them, you might wish to increase the amount of granulated sugar to appeal to a less sweet sensitive palate. This recipe is actually very forgiving both in terms of amount of sweetener and the type (as long as it’s granulated and not a liquid like honey). You could just as easily use date sugar or muscovado sugar or evaporated cane juice or maple sugar (yum!). I think whole pitted dates would work too. Also, think of this as a basic muffin recipe. You don’t need to add blueberries. You could add cranberries and white chocolate chips (a brand to look for is VeganSweets or you can make your own). You could add different berries, maybe raspberries with a little orange zest. Our you could try chopped apple, walnuts and add a little extra cinnamon (if you were going with something like chopped apple, you probably only need about 1 1/2 cups). Or you could skimp on the granulated sugar and add mini chocolate chips (I did try this and my kids loved them… I used 2 Tbsp date sugar and 1 cup of mini chocolate chips). That to me is the most exciting thing about this recipe: it’s a nut-free, coconut-free (if you use lard or palm shortening, etc. ), grain-free, dairy-free basic muffin that you can totally make into whatever your favorite muffin is. Yay!!!! Just a few notes on plantains. A very large plantain will equal about 1 cup pureed. If your plantains are on the smaller size, use 2 1/2. Many people found success using green bananas instead of plantains with my pancake recipe (you have to use 2-3 per plantain because bananas are smaller) and I see no reason why that wouldn’t work here. Also, if you use ripe plantains, you will need to adjust the egg ratio since ripe plantains have much more liquid in them. If your plantains are super ripe, this recipe probably won’t work without other adjustments since your batter will just be too liquidy. Also, just like my Perfect Paleo Pancake recipe, expect the color of your muffin to vary depending on your plantains. They might be very pale, dark brown like my photo below, slightly pinkish or even slightly green. I’m not sure if this is actually different varieties of plantain that we’re getting in the store or why else this might happen, but I’ve seen so many different variations of those colors with my pancake recipe (which I make at least once a week) that nothing surprises me any more. 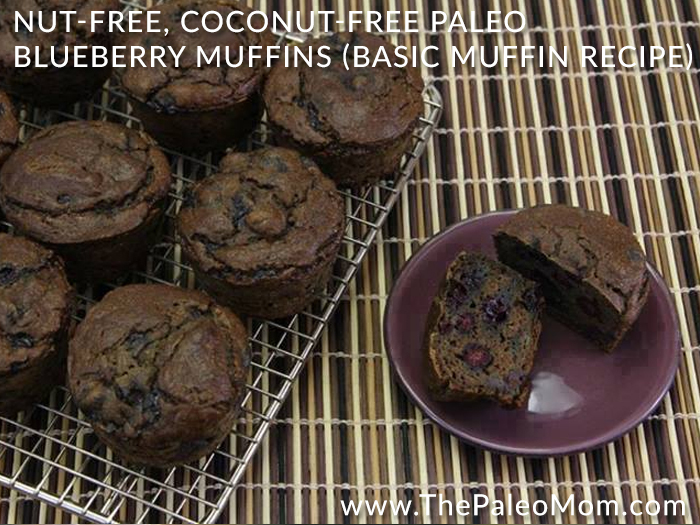 So, without further ado, here is my Paleo Blueberry (or whatever you want) Muffin recipe. Preheat oven to 350F. Grease a muffin pan or line with silicone or paper liners (I actually used a silicone muffin pan which makes this super easy). Peel plantain and place in a food processor or blender with egg, coconut oil, vanilla, sweetener, and salt. Process for 3-5 minutes, until completely smooth (you might want to scrape the sides once or twice). Add baking soda and cinnamon and process to fully incorporate. Fold in blueberries or whatever other goodies you’re using. Spoon batter into muffin pan (muffin cups should be 70-80% full, depending on how many berries or other add-ons you use). Bake for 27-30 minutes. Enjoy! I have actually never tried plaintains, in a recipe or by themselves, but it’s always something I look at in the produce isle, wonedering about them. I think I’m going to pick one up next time and try it out. Up in the text, she says you can substitute lard, palm shortening or ghee for the coconut oil to make them coconut free. I have a question about cooking with eggs. For those of us on the AIP you say egg yolks are most likely to be tolerated if seperated from the whites. Can yolks alone be used to substitute for whole eggs? They can in some recipes but not others. I haven’t tried it in this recipe. We have to stay away from eggs and flax. Do you know if chia seed “eggs” would work? Yes you can use milled/ ground chia seeds just as you would flax for “eggs” The secret I read was to let the milled seeds and water sit for several minutes. I’m going to try them in this recipe and see what happens. Can bananas be used instead of plantains to make it SCD? Any thoughts? I made these yesterday and I REALLY like them! Not too sweet, not overly dense, not overly “eggy.” Nice recipe! For a sweetener I used 5 big (nice and plump) pitted medjool dates. I put the dates into the food processor with the plantains. Worked like a charm. I tried making these today, and they came out a bit …interesting. I followed the recipe almost exactly, except that I forgot to add the baking soda until the blueberries were already mixed in, so I had to stir it in by hand. Both Kathryn and I found that the muffins tasted ok at first, but then seemed to finished with a salty/bitter taste that’s somewhat unpleasant. We’ve previously only had plantains fried in coconut oil before, so I’m not sure if it’s the plantains or something else. The plantains we got at Whole Foods were both greenish with some darker brown spots on them. Ahh, ok. I’ll have to keep an eye out for that, then. Thanks. 🙂 I grabbed a couple of plantains at Whole Foods and assumed that green+brown splotches = still fairly green/unripe. What kind of coloration should I be looking for? In all other respects the recipe was pretty perfect, it’s just that bitter aftertaste that’s hard to take. I tried another muffin this morning with some honey drizzled on it, and still had the same result. I should also mention that I used pastured lard instead of coconut oil – but again, I wouldn’t think that would make things bitter. I would think the lard would be fine. Look for completely green plantains or mostly green but just starting to be a touch yellow. When they are green but have black spots, that means they’ve been ripening under refrigeration. Are you sure you used baking *soda*, not baking *powder*? Some people don’t seem to realize there’s a difference…. Anyway, I can usually taste baking powder in foods, and find it bitter myself. Just a thought! What is the difference and how do you know when to use which (and how much)? Thanks! Why would you cut out an egg if you used a yellowish plantain? I thought a yellowish plantain would prevent the muffin from holding together. I am familiar with that bitter taste, in my pre Paleo days I would make biscuits and every time I didn’t mix the baking soda in properly or put in too much my biscuits would have that bitter/salty flavor. Maybe the baking soda wasn’t incorporated in well enough. baking soda that isn’t fully incorporated can do that. I usually use less baking soda because I can still taste it even if well incorporated. I use only 1.5 tsp is this recipe. My kids loved bed them but I found them salty, did you notice a difference in the fluffiness with less baking soda? I was thinking next time I’ll decrease or omit salt? Can you use flax or chia egg instead of the eggs? Oh My GOSH! You are my hero. Just made these and they were so incredibly good. I have read your site for a while but never posted and this recipe snapped me out of my “lurking”. THANK YOU!!! Oh my heck, you are my hero!!! 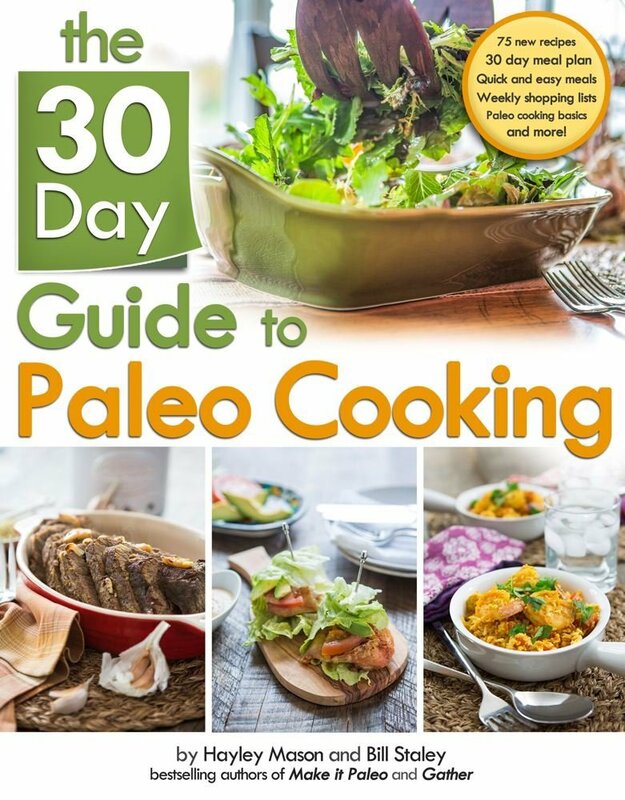 I have been searching for on the go Paleo food that I can send out the door with the kids or in lunchboxes. This is the motherload!! We have made blueberry, apple, pumpkin, carrot cake, and even Italian meat muffins using this as the base. Thank you, thank you, thank you!! No nuts, grains, gums, just perfection!! I have 6 children so this is fanatic for meals and snacks alike! Oh I want your pumpkin recipe of this!! How did u add pumpkin? Cook it halfway in chunks and add it for the fruit? Did you grate the carrots? I just made a modified version by adding cacao powder and chocolate chips. My boys gobbled them down! In fact, my older one just said that I make the best gluten free muffins ever! (Don’t worry, I gave you credit!) My guess is that I’m going to be making a lot of these over the coming school year. I made these today and they were delicious. I used about 6 dates instead of sugar and the muffins were sweet enough. The texture was good – will definitely make again. Thanks for posting! Any tips for modifying this into a cake? Thank you SO MUCH! My 8yo son loves your plantain pancakes & they have become a great school lunch option. He likes them with nut butter & jam like a sandwich (& I use a cookie cutter to make a fun shape). This recipe will be another fantastic option — I’m always struggling with what to put in his lunch! This recipie is the bomb. Substituting cocoa for the mini chips & dates as the sweetener, made for a delicious and nutritious muffin without the guilt. 🙂 I am actually working on one. what about omitting all sweetener? Maybe adding in applesauce? They work well with no sweetener at all too. I made these this morning and they got OK reviews. Like other reviewers, I and my daughter could taste the baking soda at the end. Plus, we both thought it could use a little more sweetener so I think I will use plantains that are a bit more ripe next time, as mine were very green. It is a nice base recipe and I will use it again. Thank you! Hello, sigh – for me – who is allergic to plantains and bananas – would you have an alternate suggestion? Even almond flour, something? Looking for a good recipe and new to this way of eating (5days now). Thank you! I have a ton of muffin recipes that use almond and/or coconut flour. Under Paleo baked goods under the recipe tab. Amazing! My super-picky 12 year old loves them! I made them yesterday for today’s back-to-school breakfast along with some sausage. I can’t wait to try them with other flavors. Honestly, I’m just confused. It says coconut free but has coconut oil. Umm, ?????? Read the intro for alternatives. I am a bit confused….a coconut free recipe with coconut oil? I made these today and they are very tasty…despite the fact that I left the coconut oil sitting in the microwave. I think it helped that my plantains were turning a bit yellow, though next time I’d like to use the really green ones. This is a very versatile recipe….I made mine eggless, using 2T milled chia seeds and 2T ground flaxmeal mixed with 6T water and let it sit for 15-20 minutes. To this batch I added chopped cranberries and black walnuts, instead of blueberries..my treat for myself 🙂 Next batch will be white chocolate and raspberry…too yummy. Thank you for the link to the homemade white chocolate. 2 Teaspoons of Baking soda seems like really a lot. I made them with 1 1/4 teaspons. I would be afraid to add any more than that because baking soda adds that salty bitter taste others have mentioned. They turned out fine with less baking soda. I’m a huge fan of your blog. I’ve been looking forward to making these muffins for several months, and I finally did this morning. Unfortunately, I, like many other reviewers, got beautiful looking muffins that smell wonderful and at first bite taste good, but after chewing, leave an awful strong soapy, bitter baking soda aftertaste. It was very disappointing. I consider myself a very experienced cook (with some professional training) and a pretty experienced Paleo baker. I cook with plantains a lot, and have made my own version of plantain clafoutis that turned out wonderful. I used a very green plantain. I pureed the plantain in my Vita-Mix with the eggs, ghee (instead of coconut oil), vanilla, maple syrup as the sweetener, salt, and cinnamon. I poured the batter into a mixing bowl, then whisked in 2 teaspoons of fresh (not expired) Bob’s Red Mill Baking Soda until it was very well incorporated. I stirred the blueberries in last. I increased the oven temp to 375 because my batter had more liquid from the maple syrup, and baked for about 35 minutes. I don’t know if there’s some variability in this recipe due to the use of the plantains, but I would suggest that anyone trying this recipe cut the baking soda back to 1 or 1 1/4 teaspoons at most. I hope you might revisit this recipe and make some adjustments because it’s such a great concept, and one I’d like to continue experimenting with myself. Wow, thanks for the info. on plantains. I never knew about them or what to do with them, or their different colors. is the purpose of the plantains to replace flours (coconut, almond, etc)? if so, what is the ratio? Yes. I don’t know the ratio, since I build these recipes from the ground up. 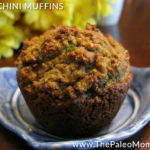 I like to use bananas and coconut flour when making Paleo muffins. Maybe in the future I will try just using plantains for a change – interesting concept. Is it possible to leave the cinnamon out of this recipe? My daughter is allergic and we try to stay away from cinnamon, as much as possible, for all of us. This wonderfully versatile recipe is a new favorite thing! Yesterday, I whipped up version with green apple and carrot, a handful of dates as the sweetner, and lots of warm spices: cinnamon, ginger, nutmeg, allspice, and clove. They had great taste and texture, and with plantains 5-for-$2, they are so much easier on the budget than a nut-flour alternative. How about freezing these…how long do they keep in the refrigerator? If you’re on the AIP, is it ok to use egg yolks and leave out the white? I need a vegan version of this same recipe (and still no nuts)—help! The 3 phase P aleo book looks like the exact resource I am looking for… however…I would like it in book form rather than e-book form… does anyone know of a similar resource in book form? These sound great and right up my alley!! Always looking for yummy, quick to heat up in the morning breakfasts! I’ll be baking this weekend! 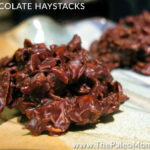 I made these today with chocolate chips and they are awesome! i never knew you could use plantains in place of flour…huge deal for me as I live a gluten free life! Thank you so much for sharing this recipie! Love this recipe! I just made it with rhubarb and peaches and it’s delicious! Tried making these last night, I substituted avocado oil, and used ‘Enjoy Life’ mini chocolate chips with 2 tablespoons of sugar cane for sweetener. I found the muffins to have wonderful texture, but they were very bland. Also noticed that they seemed greasy. Any thought/suggestions? Sidenote: Your plantain pancake recipe is amazing!!!! I just made these and I LOVE them! I really like having an alternative to coconut and nut flours. Some notes for other; I completely forgot to add the coconut oil (I left it in the microwave after melting it) and I had to add about 1/3 cup of coconut flour because I think that my plantains from the freezer were a bit riper than I thought and I had already added 8 eggs (I doubled the recipe) So they work great as a fat-free muffin albeit a bit dry secondary to the forgotten coconut oil :-). I’m excited to try these again with different mix-ins and actually having the coconut oil…Thanks for the great recipes. I can’t believe how well plantains work as flour substitutes! I made them exactly as Sarah wrote up the recipe and they were PERFECT! Would this work as a “cupcake” if I used chocolate chips? I really need to come up with cupcakes that are coconut & nut free for my son’s school. I was thinking of topping them with an icing but not sure if. Also how many muffins does the recipe make? SUPER thank you. I only have RIPE plantain recipes. I get so anxious waiting for them to blacken. This will satisfy my “are they ripe enough yet” mantra in my head. Making v-e-r-y soon. How many Carbs are in these muffins? I entered the recipe in MyFitnessPal: see the nutrition facts below. Please note that I calculated the recipe yielded 12 servings, I used 2 cups of blueberries and 4 Tbsp honey (rather than cane juice, etc.). Other than that, all my ingredients are as listed above. THIS IS THE BEST!!! I’m doing AIP AND MY boyfriend is allergic to coconut and this is a spectacular recipe! Thank you so much! I am now going to use green plantains for all of my baking. I was shocked to see it tasted like a real cake. Your video was a huge help too! I am out of date sugar & evaporated cane juice, any other sweetener that would work? Brown sugar? Not ideal, but I have tons of blueberries and a little boy who needs a muffin! 🙂 lol Thanks! Is there a way to replace eggs for the aip? Tried these once as lemon poppyseed muffins–the texture was unbelievably perfect! Since then, it seems I’m sensitive to eggs, so I’ve been experimenting. Thought I’d try a “tapioca egg” (http://www.cakeandcommerce.com/cake_and_commerce/2011/01/in-search-of-a-better-egg-substitute-for-egg-free-and-vegan-baking.html)–basically tapioca starch and water boiled into an eggwhite consistency. Only when I went to make them, the only plantains I had were yellow and brown on the outside, but still very firm inside, and near impossible to peel (like very green plantains usually are for me). This time, they didn’t rise very high, and totally sunk in the middle–so I’m trying to decide if it was the extra moisture in the yellow plantains, or my egg sub that failed. If I use yellow, would I be better off just adding tapioca flour, like the aip pizza crust recipe posted here the end of june? Or do I just really need to stick to the green plantains and try the tapioca egg again? Anyone else experiment and have a good egg sub that works with these? Can these be stored at room temperature? Just curious… Can these really be considered coconut-free if they have coconut oil in them? Look delicious! Mine were liquidy and did not rise up properly, the blueberries all sunk. Any ideas. The only replacement was olive oil, coconut allergy and honestly forgot to use shortening since the coconut was melted. I was a regular baker so I am confused, the plantains were green too. I am so allergic to coconut and look for coconut free recipes, but I understood palm ingredients are from the same family and my allergies have improved greatly since staying away from anything with palm(anything) in it, as well. Just wanted to mention in case anyone else has not made the connection. Why does this recipe claim to be coconut-free? This recipe claims to be coconut free because Sarah gives us a list of substitutes to the coconut oil. 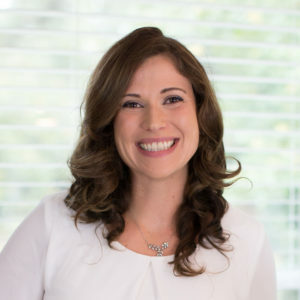 I specifically look for Paleo, nut and coconut free recipes for my kids lunch box. They go to a nut free school and there are sesame and coconut allergies in my eldest a class. Make Paleo a tricky choice. But thanks to the wonderful work Sarah does it’s not hopeless. I have a batch in the oven right now. They look and smell great. This is a nice recipe. Thank you. I didn’t think I’d ever enjoy a blueberry muffin again, or any muffin, after going grain-free a few years ago. I made these into blueberry mini-loaves (6 loaves are about the same as 12 muffins). I added 1 T soaked chia to the mix. They rose very well. I found the taste of baking soda to be very strong and distracting however, so will reduce it next time. I also feel they needed more coconut palm sugar (used about 4T) so will increase that. OTOH I liked the way this batter turned out as pancakes better than the mini-loaves, with a little coconut oil or cream and maple syrup, they were great. Is there a way to make this egg-free? my son cannot have any coconut at all, not even the oil- he is allergic and even the refined oil gives him a reaction. 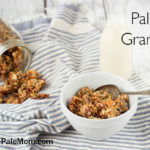 I’ve made this recipe before and love it, but in this, and any Paleo baking recipes, what do you recommend as the best sub for coconut oil? (He has a dairy allergy too, so no butter either.) What about avocado oil? Or would palm shortening be a good alternative? Thanks! I saw the picture and thought there must be chocolate in them. What makes them so brown? I am allergic to coconut and I use Spectrum Organic all vegetable shortening which is palm oil. Coconuts and palm oil come from different palm species. I do not react to palm oil, but I get hives and swelling from coconut. Hi! I’m new to AIP. I’m sensitive to corn and coconut and have a child who’s got a banana sensitivity. Any suggestions for other AIP friendly flours? I was thinking about trying water chestnut flour but can’t seem to find much about how to use it. Any other replacement for the plaintains – maybe sweet potatoes? Thanks so much! Okay, made these (and the crepes) and we loved them! I didn’t have as many blueberries so added chocolate chips and of course the kids asked no questions at that point! GREAT recipes! 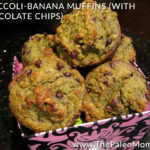 Do these muffins, or anything made with green plantains, have a banana flavor? My daughter is on the SCD, along with nut, coconut, and egg allergies. She would love these if they don’t taste like bananas. Thanks. I looove plantains. I’m from Puerto Rico and in the Caribbean we use this all the time. When I’m craving for some Carb or Salty stuff I make them… Sorry Sarah, we don’t peel the plantains like that … neither make Plantains chips like that … But is a great idea to make them different … By the way, we usually dip them in a dipping sauce called Mayo-Ketchup … Made with Mayo, Ketchup and Garlic yummmm …. Just made a carrot-walnut-raisin version of these and I love them! My toddler “helper” likes them too. I was able to use my small 4 cup food processor, but I think a full size would be handy. Instead of blueberries, I added about 1.5 C shredded carrot (squeezed dry), 1/2 C walnuts, 1/2 C raisins, and a bunch of pumpkin pie spice. (And the full 5 tbs sucanat). I think they’d hold even more carrot/walnut/raisin, as well as spice. This is a great go-to! If I had a full size cuisine art, I’d experiment with doubling the recipe. These were just ok. Probably will not make again. I need a recipe like this that uses coconut flour (nut free otherwise) that I can add different types of fruit or spices to. We have just gone nut free and my kids miss their treats. 🙁 Any suggestions?? I will continue to look on Sarah’s site to see if I find something that works. Thank you, Sarah, for the wonderful video explanation and tutorial!! I’ve never baked with plantains before and this turned out great! My 4 year old son is GFCF and these were a great alternative to my typical coconut/almond flour snacks. We just learned that he has a bunch of food sensitivities so we have to remove eggs, lots of nuts (not almonds…whew! ), coconut….so I’ll be experimenting more with these using egg replacements and different oil. Keep these nut/coconut alternatives coming! I love your recipes! I added ACV to help it rise a little more and a touch of shredded coconut. Came out the best ever! Can you use banana flour instead of fresh plaintains? I used to make these fairly often, and then got out of the habit due to wanting to cut down on eating “treats”. I just made a batch and had to come over here to rave. I had forgotten why I liked them so much–they really are quite good! If you miss made-with-wheat-flour muffins these are for sure a worthy substitute. The texture is lovely and they hit the sweet craving notes, too (I definitely add sugar to mine). I don’t recommend eating them all of the time, as they are pretty sweet and I imagine up there in the carbs department. Also, I find them pretty “addictive” and can’t seem to do them in moderation, so if you tend to over-eat sweets, you might binge a bit when you make these. But for a once in a while special treat, they are lovely. I, personally, up the amount on the cinnamon, or I can’t taste it. Otherwise I stay pretty close to the original recipe, and just use a good blender to make the batter (a cheap Ninja worked fine for me previously, and I made today’s batch in my new Vita-mix–I noticed no major difference in taste or texture between the blenders). I have made these before with fresh berries and with frozen ones, and it works great either way. Absolutely the single most ‘used-by-me’ recipe for a Paleo treat in my recipe collection. A definite go-to if I am really craving a muffin or cake-like thing. Thank you so much for sharing Judy! I’m so glad you love the recipe so much! I have just tried this recipe and the muffins are tasteless. I added blueberries but I did not add any sugar because I could not find the suggested sugars in my grocery store. Can I use pure raw can sugar? I did see that in the baking aisle. I definitely going to try this recipe again.